The Peralta Community College District’s (PCCD) Office of International Education (OIE) joined the Institute of International Education’s Generation Study Abroad (GSA) initiative in 2014 in an effort to expand study abroad opportunities for students. GSA is a five-year initiative to mobilize resources and commitments with the goal of doubling the number of U.S. students studying abroad by the end of the decade. 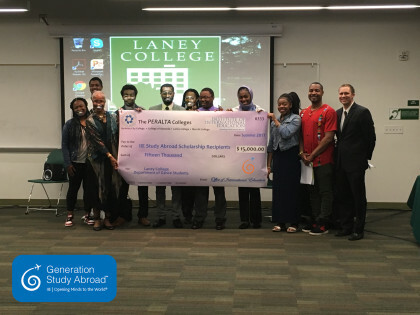 PCCD was awarded a GSA study abroad matching scholarship to provide 6 students with $2,500 each ($15,000 total – $7,500 matched by funds raised by the Department of Dance) for the Summer 2017 Dance Study Abroad programs to Ghana or Ethiopia (Valley of the Sun Tour & Program) through Laney College. As a part of their pre-international travel experience, students traveled as Global Education Ambassadors with Laney College’s Global Education for the People Initiative (GEPI) to attend the 10th Annual African American Male Education, Network and Development Conference, “Building Our Legacy: Education. Transformation. Liberation.” The conference was held at the Westin in Los Angeles, CA on March 3rd and 4th, 2017 and held over 600 California Community College Students, including several Umoja/Ubaka students from Laney. GEPI Students hosted a table where they engaged with fellow community college students on the importance of global education and study abroad; attended student success workshops; and polished their networking and leadership skills by speaking their cause to notable guest speakers Michael Eric Dyson and Marc Lamont Hill. This experience was made possible by Student Equity Funding. Contact Drew Gephart, International Services Manager, for more information about all District study abroad programs (dgephart@peralta.edu) or visit the District Study Abroad Website at http://web.peralta.edu/international/study-abroad.